What Is The Google Pixel Slate? 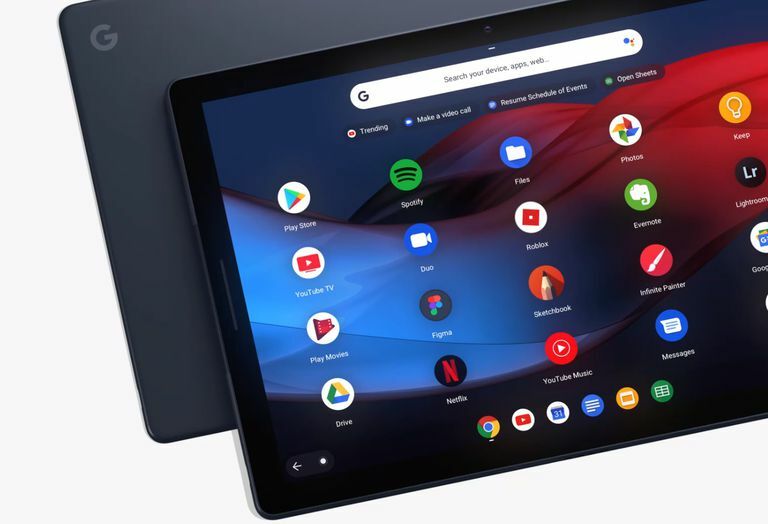 The Pixel Slate combines the careful industrial design common of Google's other products with the company's bold statement on what constitutes a computer. The Slate is sort of a hard device to nail down, so in this article we'll take it step by step. There are a four models of the Slate available in all, which differ in the processor, RAM and storage they offer. Check the product page in the Google Store for its different configurations and related prices. The Slate runs Chrome OS, regarded as one of the easiest and most secure operating systems for both home and business users. Not only is it built on a Linux base that is (many would say) less vulnerable to viruses and other malware, it also features regular updates for security and additional features. As of recent releases, certain models have the ability to run Android applications. The Slate is one of these. Even more recently Google added the ability to install Linux applications on Chrome OS as well (it is Linux under the hood, after all). The Pixel's self-titled Molecular Screen shares the same 3:2 ratio as other Google devices. It's high PPI and color spectrum are optimized for watching videos and consuming other media. The 48 mWh battery will give you 12 hours of runtime, according to Google, meaning you'll be charged up throughout the work day. You can also get get a 2-hour charge in just 15 minutes with fast USB-C charging. An optional Pixelbook Pen gives you accurate, pressure sensitive drawing. Plus you can use it to activate Google Assistant. While the Slate is a tablet first, some of the hardware configurations are more focused on the enterprise market. To that end, there are a number of keyboard accessories available for productivity. Google's own Pixel Slate Keyboard is a standard folding-style model, but the G-Type for Google Pixel Slate keyboard from Brydge is an arguably easier-to-use and business-like option. Speaking of, Google Assistant is built into the Slate, allowing you to (for example) dictate an email, set a reminder for yourself, or control your smart home devices via voice command. On the subject of integration, if you have other Google devices, you can unlock your Slate with your Pixel phone, or use it to compose and send text messages. While these bullet points give an overview of the Slate's capabilities, alone they don't really tell the whole story. Continue reading to learn how some of these features combine to make the Slate a real step forward. While Chrome OS 2-in-1's have existed for some time now, many of them use the "convertible" form factor. This means they were designed for use with the (permanently attached) keyboard and touchpad, but you could also fold them over and use them like a tablet if you wanted. For users really searching for a tablet, however, this creates two problems. First, the additional hardware brings with it extra weight and bulk. This will stay with you (literally) all the time, even if all you want to do is watch some YouTube videos or scroll your news feed. You could also argue that this extra hardware will draw power that could be saved otherwise, but this is a minor point in the larger scheme of things. In addition, the earlier versions of Chrome OS were designed around keyboard and cursor input from the software perspective. Users of the first generation of convertibles often complained that interfaces weren't geared towards the tablet form factor: controls were too small to touch, applications didn't react well to screen rotation, etc. Google is also starting to up their game in support for pen devices. Google means for the combination of the Slate and the aforementioned Pixelbook Pen to feel like pen on paper. It can be used to take notes in apps like Google Keep (even when the screen is locked), create sketches, select text on-screen, and even activate Google Assistant. All these things add up to a much more capable tablet OS than the one available just a few years ago. And the Slate's announcement is proof enough of Google's confidence in the system's tablet features to release a device that's tablet-first. There are several characteristics of Chrome OS that make it an excellent choice for an everyday OS. Firstly, it's roots as a browser-only OS mean it's simple and elegant. Some PC operating systems have become bloated by trying to include every feature in the world. Chrome OS' minimalist approach, however, make it well-suited for everyone from casual home users to professionals on-the-go to older users who don't need complexity. If you want to send an email to your grandchild, open Gmail. If you want to watch a show, select Hulu or Netflix from among the big, clear list of icons in the launcher. While there are certainly powerful applications available on Chrome OS, it only needs to become as complex as you choose to make it. But should you choose to go down that road, Chrome OS offers what may be the largest selection of software on any platform in the world, desktop or mobile. From the very beginning, Chrome OS focused on bringing web applications to your device in a way that didn't seem to cloud-like. You had (or could get) desktop icons for apps like Google Docs, Evernote, or Spotify. There was a push to make these web apps offline-capable, meaning you could use them when you weren't connected to the internet. So while the original thinking was that you'd store your data in the cloud as well, the local storage grew to meet the demands of these offline apps. Now, in addition to the native applications, Chrome OS can also run software for two other important platforms. The first is Android, giving users of most devices access to the Google Play Store and the 2.6 million apps it contains. Of course, not all apps are optimized for a larger screen (an issue we saw with Android tablets as well), and some may not even work at all. But for the most part these will install and run on your Slate. The more recent addition is Linux apps, which provides access to desktop-class software. Now, you might not be able to install Office or Photoshop, but you can get their open source alternatives. All in all, the Chrome OS platform opens up access to a wide variety of software, and the Slate gives this to you in a nice, portable package. Finally, the Slate was designed from the start not just as a tablet, but as a tablet that could turn into more. Google's own keyboard was announced at launch, as well as a new version (color, actually) of the Pixelbook pen. But the Designers at Google also imagined other peripherals. The descriptions of the device on various web pages also mention docks that could be connected to a regular monitor, keyboard, and mouse to make the device into a makeshift desktop. This isn't anything current Chromebooks can't do. But the point here is that the Google designers didn't preclude the Slate from this just because it's a mobile-first device. One feature that really demonstrates this goal is Desktop Mode. Introduced in Chrome OS 70, the default desktop/launcher contains large, well-spaced icons that are easy to tap with a finger. It also defaults to a two-app split-screen mode. But attach a keyboard or mouse, and the system swaps over to a more familiar look with overlapping windows. This provides the best of both worlds in terms of media consumption and productivity. With the amount of thought the folks at Google have put into making the Pixel Slate both flexible and capable, their message is clear: They want the Pixel Slate to be your everyday computer. Now, there are certainly users for whom this won't be true. Programmers, for example, require a great deal of horsepower to compile the programs they write, and video engineers need scads of storage for raw video footage. But for the average consumer, the Slate provides a complete browsing experience along with access to the Android apps they may already use on a phone. For non-technical business users, the security and cloud-facing features of Chrome OS make the Slate a perfectly adequate choice (and their system admins will love it). There are even exceptions to the exceptions above, however. The Slate can easily handle the text editing and server access needs of web developers, while short-form video such as vlogging is well within the grasp of a mobile device. So before you just go in for a new laptop that might cost more, weight more, and be less flexible, give the Slate a close look. It could be the "everyday computer" you've been looking for.